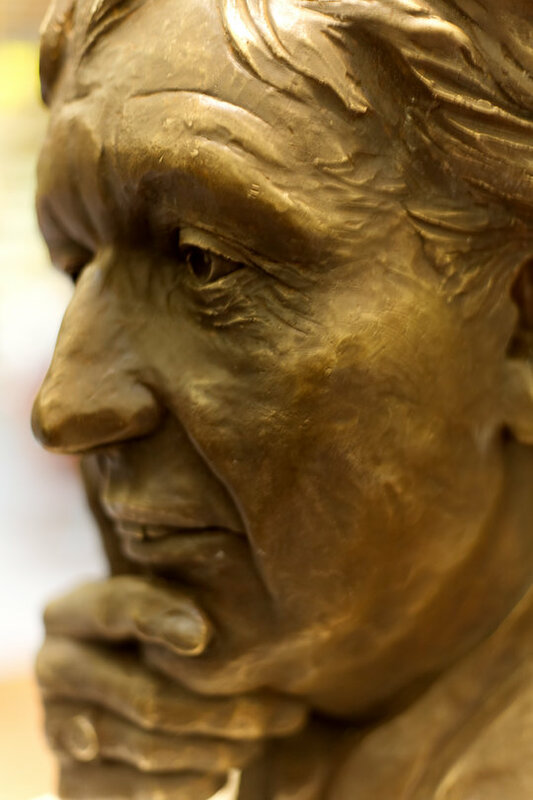 A new sculpture honouring Sir Ken Dodd has been installed in one of the late comedian’s favourite haunts. 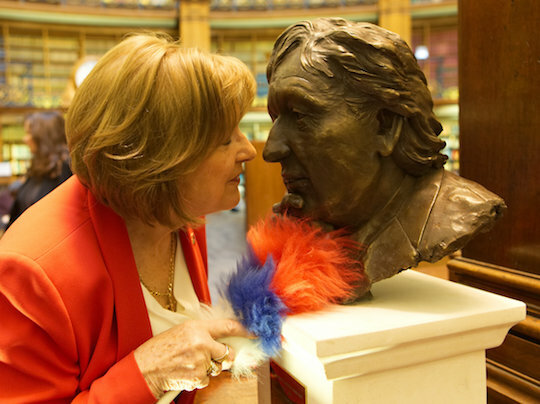 His widow, Lady Dodd, will officially unveil the life-size bronze bust of her late husband in Liverpool Central Library’s Picton Reading Room tonight. For most of his life Doddy – who died aged 90 in March this year – was a regular visitor to the library, spending hours reading and also researching the history of comedy. Lady Dodd was approached by portrait sculptor Jane Robbins – sister of comedian and actor Kate – who wanted to create an image of Sir Ken which showcased a more thoughtful image from his madcap showbiz persona. Impressed with the design, Lady Dodd commissioned Jane to produce the work which is based on a favourite photograph by Stephen Shakeshaft, former picture editor of the Liverpool Daily Post and Echo. 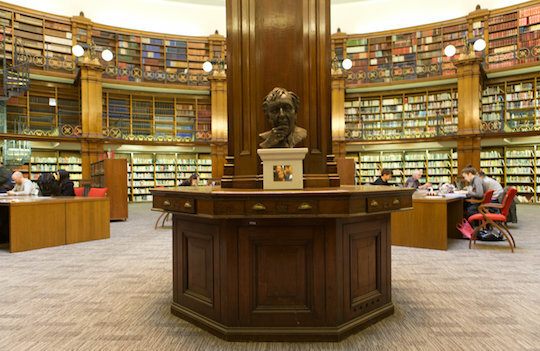 Lady Dodd said: ‘I was touched when Jane told me how she wanted to portray Ken, and I couldn’t think of a more fitting venue for it to be on display than the Picton Reading Room. ‘He was fond of the library as a whole, but this room held a special place in his heart and it’s where he would want to be remembered. 'Since Ken passed away I have been overwhelmed by the outpouring of kindness from all over the world, and I am delighted that people will be able to head to Central Library and appreciate this permanent tribute to my husband." The bust will be mounted onto Portland Stone which is used in many of the historic buildings found in the city. 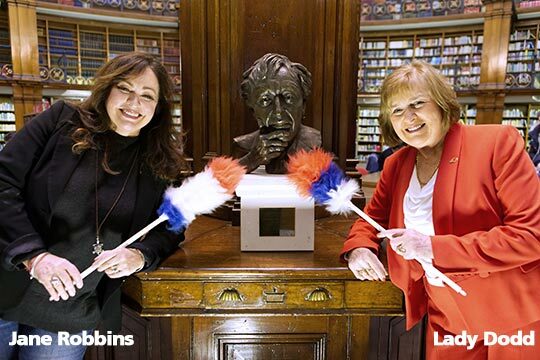 A plaque will contain two quotes inscribed on it: ‘The greatest comedian of our lifetime – kissed with genius,’ from- Michael Billington of The Guardian and ‘He loved books and the tranquillity of this room, a favourite place’ from Lady Dodd. Jane Robbins, who is based in Cheshire. added: ‘It has been a real honour for me to produce this portrait. I came from a showbiz background and we lived and breathed Ken’s humour. ‘For years I have wanted to create a sculpture of him, so people can remember him for the well-read and intelligent person he was, and it feels so right that it will be on display somewhere that meant so much to him. Liverpool’s head of libraries John Keane who was a young librarian at Central Library in the late 1970s and early 1980s, revealled: ‘Ken used to pop in regularly to change his books and his LPs as he was really into his music as well as reading. ‘He always had a ready quip and would have us all in stitches practising his new jokes on us! The Picton Reading Room feels like the perfect place for Ken to be remembered in this way." The sculpture will be available for the public to see from tomorrow, and will be on permanent loan to the City of Liverpool. There has also been a life-sized bronze of the comedian in Liverpool’s Lime Street station since 2009, created by sculptor Tom Murphy and part of a larger work called Chance Meeting, which also includes a statue of campaigning MP Bessie Braddock. Although this statue has been absent for most of this year as the station gets a facelift. Liverpool Mayor Joe Anderson said: ‘Doddy was one of a kind and his contribution, not only to comedy, but to the life in Liverpool was unparalleled. ‘It’s hard to believe it’s been seven months since he left us, but it feels like the right time for this new tribute to Sir Ken to take pride of place in a venue which he held dear.